You can't beat a rubber broom for it's ability to sweep up the tough stuff. Use it on everyday debris, or sweep up stuff that other brooms can't handle like hair and sand. The rubber brush puts all of that sweeping power into the palm of your hand, so it is great for areas like stairs and upholstery. With both of these products you will be more than ready to tackle pet hair and other messes all over your home. This money saving combo includes one or two rubber brooms and one rubber brush. You can purchase these products separately, but you will pay a lower price with this combo. 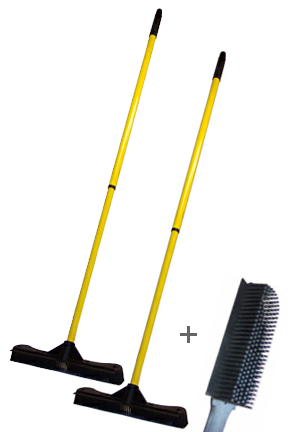 Order your broom and brush combo today! Sweepa Commercial Rubber Broom - Incredibly durable and long lasting, this is the perfect broom for commercial or industrial use. It will outperform traditional tools and last longer too. Save time, money and frustration when you start sweeping with this broom. Order One Today! Dimensions 9.8" x 1.8" x 5.5"
Color Varies - request specific color if one is desired. The Sweepa Rubber Pet Hair Brush - The best pet brush available because it is a combination grooming and cleaning brush. You can stop worrying about shedding dogs and cats when you order yours today! I Love My Rubber Broom! !It does gather my cats hair all over the floor as I pull it.It also does great getting cat litter up! I wish I had gotten it years ago!! Thank You So Much! Works great as promised! Love it! I was glad to find this broom and brush combo, and I'm very happy with your price and service. I had really high hopes for this broom. I bought a new vacuum and was hoping using this broom would make it last more than a year. Unfortunately this broom did not work on my carpet. I am hoping that it is because it does not work on berber. Therefore I will keep it until I get my carpet replaced. Hopefully I can make my new vacuum last until that point. It is soft enough though that I can use it to sweep my hardwood flooring without worries of scratching. Love, love this broom. Catches everything. I bought a knock-off version from The Container Store. Get this one - it works 1000xs better and has a longer handle. Easier on the back. You will be addicted at how amazing it works - and disgusted at what you sweep up. These are our 6th purchase and are so happy with them. We gave our previous brooms as gifts, and now more people are asking about them. I honestly did not think this rubber broom would pick up hair as flawlessly as it does......and with no nasty dirt flying around like when I use a normal broom! My husband and teenage son actually look forward to sweeping the floors to see how much dirt they can pull up with it........best purchase of a broom we have ever made!!! We have been using these in our veterinary clinic for years since I first purchased them at a trade show. They are the perfect thing for scrubbing and squeegeeing our runs. They eventually wear out from daily use and I have replaced them several times. Please don't quit carrying them!!! I really like the rubber broom for my hardwood floors and and as pre vacuum swipe for my carpet. I wanted this for removing dog hair and I am happy with the results and the price. I bought the rubber broom and brush to help clean up the very fine cat hair my sweeper won't pick up. The rubber broom is doing a nice job. It gets the hair out of the carpet. The vacuum can pick up the rolls of fur made by the broom. I didn't understand how short a 13.5 in broom handle is. I will need to purchase a longer handle. simplygoodstuff response: The handle is telescoping. When delivered, it will be fully collapsed. Simply twist to loosen, and then extend to whatever length you prefer. It is able to be as long as a standard pole, so please call or email if you are having trouble. I am hooked on rubber bristle brooms and so glad Simply Good Stuff has these great brooms available. A quality product with reasonable prices are hard to find these days. Thank You. The Sweepa broom is so awesome especially if you have pets. It works on hardwood floors, tile and carpeting. The hand brush works great for any furniture/cars that you may have. I will always buy these from now on instead of a regular broom there is no comparison. It gets up all the hair and the great thing is the broom itself is so easy to keep clean and hair free. Excellent purchase. I have four dogs and two of them, a Pug and a Huskie, shed tons of hair. These brooms are easy, if not the best tools, to collect all hair and begin a new day everyday. The broom reaches every corner, floors, rugs and sofas. I honestly don't know how I survived without them!! I never write reviews for products but this one deserves a RAVE REVIEW!!! These brooms are amazing. I had one from the County Fair years ago and used it to death. I had forgotten how amazing they are. I have 5 dogs, 5 cats, and chickens that think they should be able to come into the house. These brooms are the best on my wood floors for gathering hair, dirt, and dust on a daily basis. No broom or vac gets it like these brooms. Also amazing for the patio and for pushing water after a rain to speed up drying time outside on the patio and walkways. Can you tell I love this broom??? This is a great product. I had a similar broom before but the handle broke after much usage. Really picks up anything and everything off of outdoor carpeting. Even picks up the smallest particles off of any surface. Hope the handles are sturdy but time will tell. The small brush is so so. It does pick up from furniture but not so much from the animals. They still like being brushed as both Golden's line up to get their massage. My wife is a clean FREAK! We have 2 big dogs, She Vacuums 2 times a day, and we still pulled an unbelievable amount of dog hair out of our carpet. This broom is unreal.. Takes a little more effort to rake than a vacuum but 1000 times better. One word "UNREAL"
The main reason I bought these brooms was because I am constantly sweeping/vacuuming up dog hair - daily! I usually use your typical straw broom or a big dust broom - however it just seems as if as soon as i'm done, I look back and yet it looked like I hadn't even swept. These brooms actually grabs the hair and holds on to it -- so it makes me feel that all my sweeping was not in vain! HA! I would recommend this broom. The small brush comes in handy when cleaning out excess dog hair from the dog beds. Yes. The number of brooms is an option. Adding a second one will raise the price. For the initial price shown, it is one broom and one brush. If you select the two broom option, the new higher price will display. Shipping will vary depending upon location, so add to cart and use the calculator there to see how much it will be prior to checkout. The broom sounds perfect for my cleaning needs. Do you also have a dustpan to for this size broom? At this time, no, we do not carry a matching dustpan.